Abhinavagupta (fl. c. 975 - 1025) was one of India's great literary critics and philosophers. He was a master of the Kula school of Shaivism, but wrote commentaries elucidating various texts and schools of thought. His ability to clarify the meaning of ancient texts through the application of reason and logic, and through his personal experience of religious practice, helped to popularize Kashmiri Shaivism. His Tantra-Âloka (Light on the Tantras), which appears to have been written after Abhinavagupta had attained enlightenment, is one of the great accomplishments in Indian religious thought and influenced the understanding of the inner meaning of ritual in the Shaiva and Shakta schools for centuries afterward. Abhinavagupta also wrote on aesthetics, music and a variety of other subjects. His two famous commentaries on poetry, drama, and dance, the Locana on the Dhvanyaloka and the Abhinavabharati on the Natyasastra engage almost every important aspect of Indian aesthetics. Most of the information about the life of Abhinavagupta is gleaned from his own writings. Abhinavagupta was a Brahmin whose ancestors had been distinguished scholars in the court of Kanauj. His ancestor Atrigupta, who was born in Antarvedi, the Doab between the Ganges and the Jamuna, was serving the king of Kanauj Yasosvarman, who was defeated by King Lalitaditya (c. 725 – 761). King Lalitaditya brought Atrigupta to Kashmir along with the booty, and, "in that beautiful city (Srinagar) like that of Kubera's (Alka) in front of the temple of "Sheetanshumauli" (Siva having the moon as his crest) on the Vitasta, the king got built for him a spacious house and also granted a Jagir of land to him.” Abhinavagupta’s grandfather was Varagupta and his father Naramsimhagupta, also known as Cukhala. Abhinavagupa was born in Kashmir around 940 - 950 C.E.. His beloved mother, Abhinavagupta, Vimalakala, died when he was still a child. In Kashmir it is traditionally believed that Abhinava was a Yoginibhu (born of a Yogini). His family had a long tradition of scholarship and his parents were sincere devotees of Lord Shiva. About his family, Abhinava says, “All the members of the family regarded material wealth as a straw and they set their hearts on the contemplation of Shiva.” His uncle Vamana Gupta was an expert in poetics. His father, Narasimha Gupta, taught him Sanskrit grammar, logic and literature. It is said that in his youth, Abhinavagupta learned easily and readily comprehended even difficult philosophical concepts, and his speech was measured and elegant. Abhinavagupta’s principal teacher was Lakshmana Gupta, but he traveled widely, even outside of Kashmir, to study different Shastras (teachings) under different at least 19 different teachers, including Buddhist and Jaina masters. In his Tantraloka (V11, 205, 206) he says that even though one might be lucky enough to get a teacher who has attained perfection himself and can easily lead his pupil to it, that does not mean one should not approach other teachers for obtaining knowledge of other teachings and other paths. He successively practiced and contributed to the development of each of Kashmir Shaivism’s three great schools, Krama, Trika, and Kula. Abhinavagupta credited the teacher Shâmbhu Nâtha in Jâlandhara, from whom he received the practices of the Kaula tradition, with leading him to enlightenment and true peace. Later in his life, Abhinavagupta rose to the position of Acharya [Master] of the Shaiva sects in Kashmir. When Abhinavagupta wrote Tantaloka (The Light of the Tantras) in his early middle age, he seems to have had just a small group of close disciples, almost all of whom were members of his family. He tells us that his brother Manoratha was one of the first to learn from him and that he was later joined by Karna, the husband of his sister Amba. When Karna died prematurely and left Amba alone with their only son, she devoted herself entirely to the worship of Lord Shiva and the service of her brother. Karna’s father, a minister who had left the court to become “a minister of the Lord;” her father’s sister, Vatsalika; and Mandra, Karna’s cousin and close friend, were all devoted to him and served him faithfully. Mandra invited Abhinavagupta to stay in his town outside Pravapura (modern Srinagar) where, in the house of Vatsalika, he wrote his Tantaloka for the benefit of his disciples, who Abhinavagupta tells us at the end of his work, wanted to gain “a perfect knowledge of the Tantras.” Almost all the other disciples he refers to were sons of his paternal uncle, Utpala, Abhinava, Chakraka and Padamgupta and one named ‘Kshema,’ who might have been Kshemaraja, his most distinguished disciple. The date of Abhinavagupta’s death is estimated at around 1025 C.E.. According to Kashmiri tradition, he entered a cave while reciting the Bhairavastava along with 1,200 disciples, and was never seen again. This cave, alleged to be his burial place, is located at "Birwa" village some five miles from Magam on the Gulmarg range. 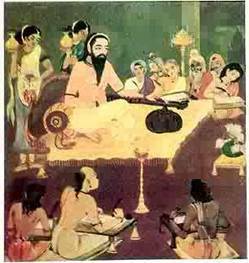 Abhinavagupta is considered the greatest exegetical theologian of the Shaiva tradition in the medieval period. A prolific and polymathic writer, he is credited with the authorship of as manyas fifty works, only some of which survive to the present day. The two most important philosophical writings were the Parâtrimshikâ-Vivarana and the Tantraloka. Parmarthsara, a philosophical composition of 105 verses, was supposed to be based on the Karikas of Shesha. Other philosophical works were Tantrasara, Gitartha-Sangraha (commentary on the Bhagavad Gita), and Parmarthasara. In addition to his philosophical discussions, he wrote contributed to rhetoric with his commentary on Bharata's Natya Shastra (Abhinavabharati), poetics with his commentary on Anandavardhan's Dhvanayloka (the Locana), aesthetics, drama, dance, and linguistics. His work is more of a commentary on and elaboration of existing schools of thought than an original system. He wrote from his personal experience and used reason and logic to explain the meaning of ancient authoritative texts, treating them in a realistic way and making them understandable to the people. In this way he popularized the Pratyabhijna school of Shaivism, which had been introduced by Somananda and Uptala. In his commentary on the Bhagavad Gita, Gitarthasangraha, Abhinavagupta emphatically declared that freedom from all miseries can be obtained by seeing Him (Paramshiva) in everything and everywhere, and not by renunciation of the world. The impending battle between Pandvas and Kaurvas is interpreted as the race between Vidya (knowledge, perception) and Avidya (ignorance, blurred perception). Pratyabhijnavimarshini and its larger edition Viviriti belong to the Pratyabhijna (recognition) school of Shaiva Shastra as propounded by Utpala Deva and originated by Somananda. Both Vedanta and Shaivism professed the same goal: "the removal of veil of ignorance." While in Vedanta the negation of facts of experience was the requirement for realization of the self, Shaivism taught that the self was realized through embracing the facts of experience and recognizing itself in every aspect of the universe. Abhinavagupta defined the term "Pratyabhijna" as: “Recognition of that supreme self is by coming face to face with what was forgotten through effulgence (of consciousness).” Abhinavagupta explained cognition as taking place “when the past perception and the present perception are revived (by the object coming in full view)." Ahbinavagupta explains the apparent contradiction between unity and plurality by saying that in essence, objects are internally one consciousness, but externally, at the illusory level, they are differentiated by physical characteristics. Among Abhinavagupta’s contributions to aesthetics is his analysis of eight types of rasa (the emotional experience of poetry or drama). He explored how the appreciation of art, music, poetry and literature was heightened by the removal of moha (ignorance), and how their beauty was enhanced through knowledge of Brahman. "Abhinavagupta has made the blazing Sun of commentary [on Tantra] manifest that is bent on extirpating the darkness of misleading, wretched commentaries lacking the refinement of good teaching and tradition … [and] by its flashing lustre, melts the coagulated stream of innumerable bonds." Somanda on Abhinavagupta. “Abhinava Gupta, who lived from c. 950 to c. 1020 C.E., achieved fame as the foremost adept-philosopher of the Shaiva tradition of Kashmir. We know from Abhinava Gupta himself that his father Narasimha Gupta (or Cukhulaka) taught him grammar. His love of knowledge was unparalleled, and he had numerous teachers in a wide range of subjects, with his principal teacher being Lakshmana Gupta. It was, however, Shâmbhu Nâtha to whom Abhinava Gupta paid tribute for leading him to true Self-realization, or enlightenment. In his youth, Abhinava Gupta showed all the signs of genius: He learned easily and readily comprehended even difficult philosophical concepts, and his speech was measured and elegant. His intellectual acumen was combined with a rare humility, which prompted his teachers to share all their knowledge with him. He had numerous teachers and spared no pains to find and serve them as an ideal pupil. He travelled far and wide to gather traditional wisdom, and his travels also led him to Shâmbhu Nâtha in Jâlandhara from whom he received the practices of the Kaula tradition. He successively practiced and contributed to the development of Kashmir Shaivism’s three great schools—Krama, Trika, and Kula. Only in his study and practice of the Kula school did he find fulfillment and inner peace. Abhinava Gupta is credited with the authorship of some fifty works, the two most important philosophical writings being the above-mentioned Parâtrimshikâ-Vivarana and the voluminous Tantra-Âloka (consisting of twelve volumes in translation). It appears that the many quotations in the Tantra-Âloka were all cited from memory, evincing his extraordinary intellectual talent. The latter work appears to have been written only after Abhinava Gupta had attained enlightenment … In addition to his philosophical discussions, he also contributed to aesthetics, poetics, drama, dance, and linguistics. “It is traditionally believed in Kashmir that Abhinava was a Yoginibhu, i.e. born of a Yogini. The parents of Abhinava were sincere devotees of Lord Shiva. Abhinava in later life rose to the position of Acharya [master] of the Shaiva sects in Kashmir by virtue of his exposition of Shaiva philosophy and practice of the life of a Shaiva yogin. Abhinavagupta has been mentioned by later writers as ‘Abhinavaguptapada’, The word ‘pada’ is used here to indicate honour. However the whole word points out to a hidden implication. The word ‘Guptapada’ means a serpent or Shesha. Hence the term ‘Abhinavaguptapada’ would mean ‘a new incarnation of Shesha’. Abhinavagupta has an insatiable desire for learning. He studied different Shastras (teachings) under different teachers and went even out of Kashmir to do so, In his Tantraloka (V11, 205,206) he says that even though one might be lucky enough to get a teacher who has attained perfection himself and can easily lead his pupil to it, yet that does not mean one should not approach other teachers for obtaining knowledge of other teachings and other paths. He preached this, both by precept and example, for even though he was fully satisfied with the tenets and teachings of Shaiva Shastras, he, because of his boundless curiosity and unquenchable thirst for knowledge, studied under teachers of other sects such as Buddhims and Jainism. “I was also thrown into confusion by many who presumed to be teachers of truth by declaring ‘That am I’ [Shiva] but whose tongue had not even contracted the two words ‘That’ and ‘Thou’. "Abhinavagupta has made the blazing Sun of commentary [on Tantra] manifest that is bent on extirpating the darkness of misleading, wretched commentaries lacking the refinement of good teaching and tradition ... [and] by its flashing lustre, melts the coagulated stream of innumerable bonds."